The marriage record of my 2nd great-grandmother, Delila or Delia Davis Harmon, has a document signed by Morris Davis giving permission for his daughter, Delilah Davis, to marry Thomas Harmon. 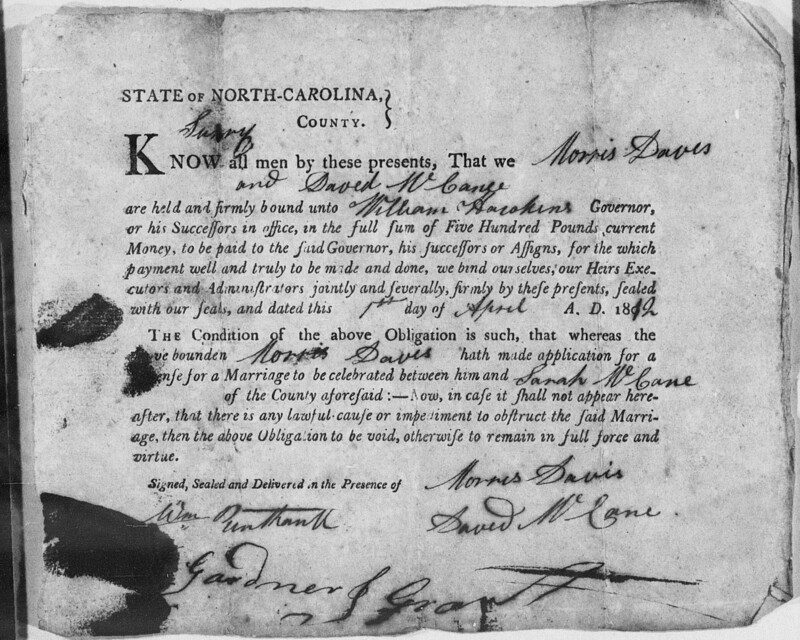 A marriage bond image (2) was available through FamilySearch.org for Morris Davis and Sarah McCane on April 1 1812 in Surry County, Virginia, a county just across the border south of Grayson County, North Carolina, which provides the maiden name for Morris’ wife/Delilah’s mother. The bond was jointly signed by Morris Davis and David McCane; the relationship between David McCane and Sarah is unknown. He could have been her father, her brother or perhaps an uncle. Tax records and census records for Morris Davis indicate he and his wife and children lived in Grayson County, Virginia until the county boundaries changed in 1842 when the area where they lived was changed to Carroll County. It was only in the 1850 census (3) that a name was once again given to Morris Davis’ wife: Sarah. The below clip of the census begins with their son, William and his wife, followed by Morris and Sarah and three of their younger children: Nancy, Jane and Morris. Sarah and Morris were the parents of eight known children: David (1814), Elizabeth (1815), Delila (1818), Sarah (1820), Nancy (1825), William (1827), Jane (1835), and Morris (1838). By the 1860 census, Morris was enumerated with his daughter and son-in-law in Clinton County, Ohio; Sarah was not enumerated and her death is assumed. It is not known if Sarah made the move to Clinton County and then died or if Morris made the move to Clinton County following the death of his wife. No records have, as yet, been located for either Morris or Sarah. (1) “Virginia, Deaths and Burials, 1853-1912,” index, FamilySearch (https://familysearch.org/pal:/MM9.1.1/X5RV-LNY : accessed 16 Nov 2014), Delia Harman, 05 Nov 1888; citing Carroll, Virginia, reference p91c38; FHL microfilm 2056976. (2) “North Carolina, County Marriages, 1762-1979 ,” index and images, FamilySearch (https://familysearch.org/pal:/MM9.3.1/TH-266-11664-134147-82?cc=1726957 : accessed 16 Nov 2014), 004364145 > image 75 of 686; county courthouses, North Carolina. This blog was prepared as a part of Amy Johnson Crow’s No Story Too Small 52 Ancestors in 52 Weeks Challenge.